Kirk Bell November 14, 2017 Comment Now! 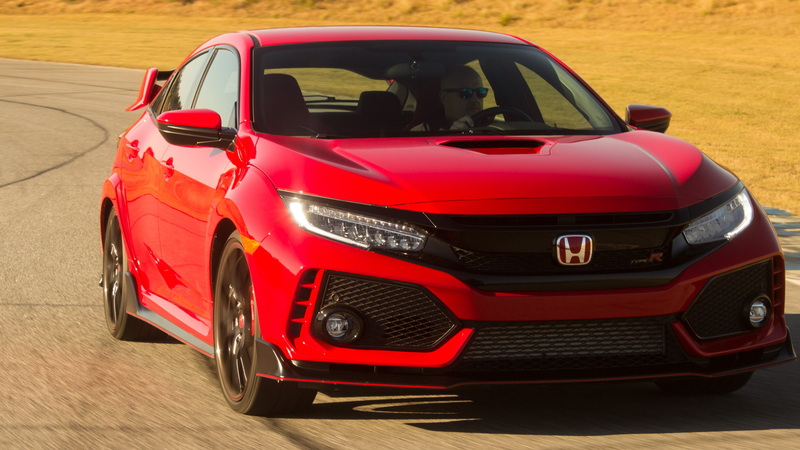 The Motor Authority Best Car To Buy 2018 is the Honda Civic Type R. We said as much Monday. With its combination of exhilarating performance and downright value, you would think it would be a shoo-in for the award. Think again. The competition was fast and fierce this year and covered wide ground with worthy competitors, namely the Lexus LC 500, Porsche Panamera, and Kia Stinger GT. We were ever-diligent in picking a winner this year: we drove and we asked questions, took names, compared notes, asked more questions, fought, made up, and drove some more. Our proving ground was the Atlanta Motorsports Park, temporarily delayed by a plane crash (!) on our first day of testing. We returned the following day to put our four finalists to the test, back-to-back-to-back-to-back style. By the time we took the vote, our finalists were like family. Our staff drove our four finalists at various times throughout the year, for a few hundred miles during our top-secret Best Car To Buy testing week, and in the spirited manner they were intended on the 2.0-mile Atlanta Motorsport circuit. After driving the cars like we owned 'em and like we stole 'em, we gathered around a dining room table and a campfire to duke it out. The Civic Type R came out on top, but it was a close call with the surprisingly good Lexus LC 500. The following is what our crew had to say about each of our finalists. We all loved the Civic Type R's engaging performance, razor-sharp handling, power delivery, and surprisingly compliant ride on the road. The Car Connection Senior Editor Andrew Ganz put it best: "This one's a giggle factory. You can't help but love its scrappy nature, but unlike most of its rivals, it's comfortable and compliant around town," he said. Managing Editor Aaron Cole had a reason why it works so well on the street. "Underneath it all it’s a Civic, after all. And that’s it’s best secret," he observed. "Drive it to the track, and drive it home. What more can you ask for?" Our editors noted a few features in particular that stood out, including the driving position and driver's seat, which even works for larger guys; the clutch, gearshift, and round metal shift knob; and the outward visibility. We liked the Type R even more when we got it to the track, where it proved to be the most hunkered down, stable, and grippy car of the group. With 306 horses, it was down on power from the competition, but its stability, grip, and light weight let it carry more speed through corners than the others and made it almost as fast at the end of the longest straight. I saw 114 mph at the end of the front stretch compared to 118 mph in the fastest car, the Panamera 4S. That's with 134 fewer horses. 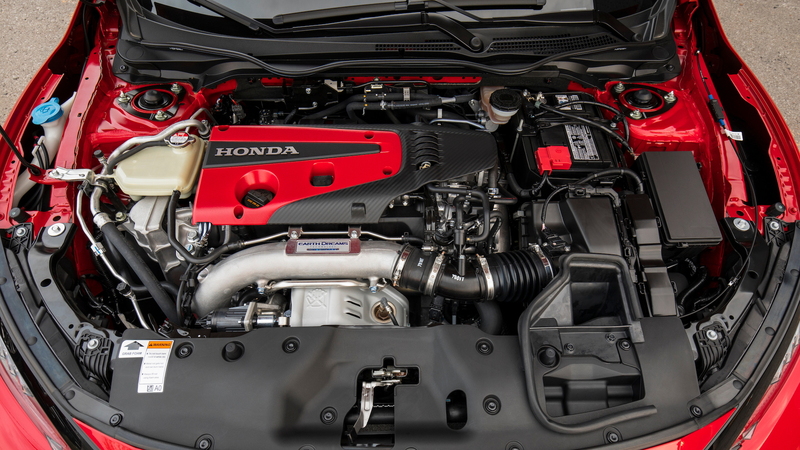 Cars Direct Senior Editor Brandon Turkus felt at home in the Type R on a new track. "Remarkably fun, but more importantly, remarkably approachable," he said. 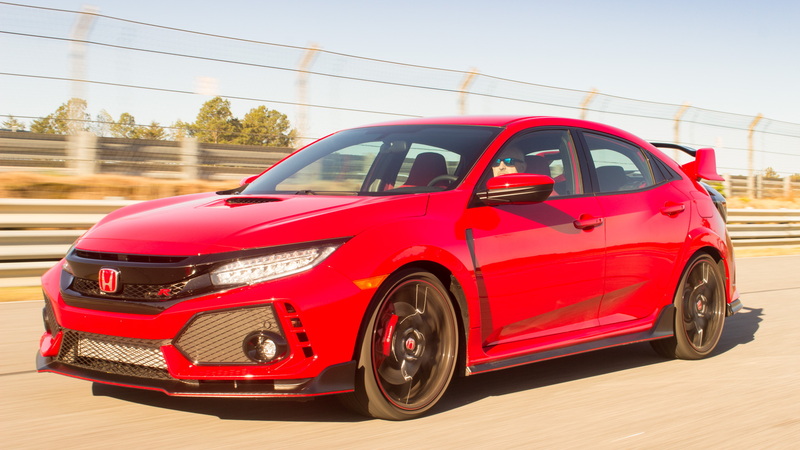 "I took this car out on a track I’d barely familiarized myself with and felt an unending sense of confidence that the Civic Type R would execute my every wish." Interactive Content Manager Joel Feder was a bit more colorful. "It’s like a firecracker you light off and hang onto for the ride," he quipped. Editorial Director Marty Padgett praised the handling, but noted it won't beat the competition on the track. "Flat through the corners. It is not the best-handling car of its kind, and that gives it a limited shelf life," he said. Turkus felt that doesn't matter. "I don’t agree with others who say it needs AWD. It’d ruin the tossability, and understeer is only an issue if you let it be," he argued. Nonetheless, we all agree that a Subaru WRX STI and a Ford Focus RS will beat the Type R around a racetrack. 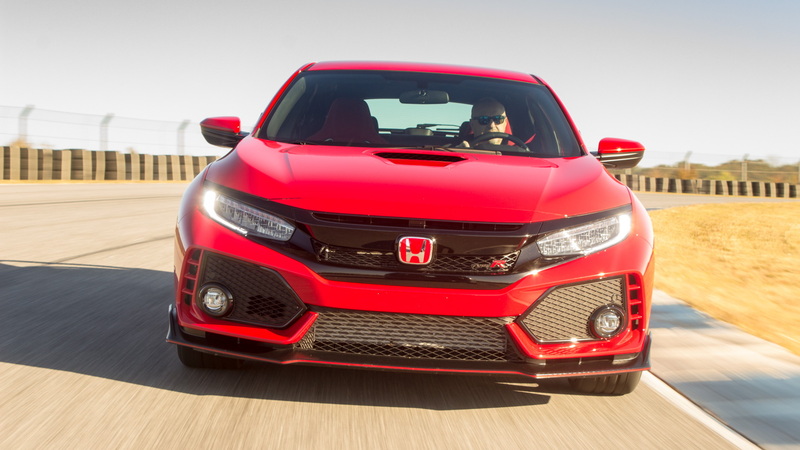 We also agree that the Type R's looks are sophomoric. Padgett: "Outrageous in the way it chews into view with scoops and flares and wings and all the things that turn on fanbois. The Type R's tiring on the eyes after a few hours, but the way it flips from street to track fluency never gets old." Feder summed up our thoughts on the design: "No self-respecting person over 32 can drive the Type R daily and not feel silly with that rear wing." 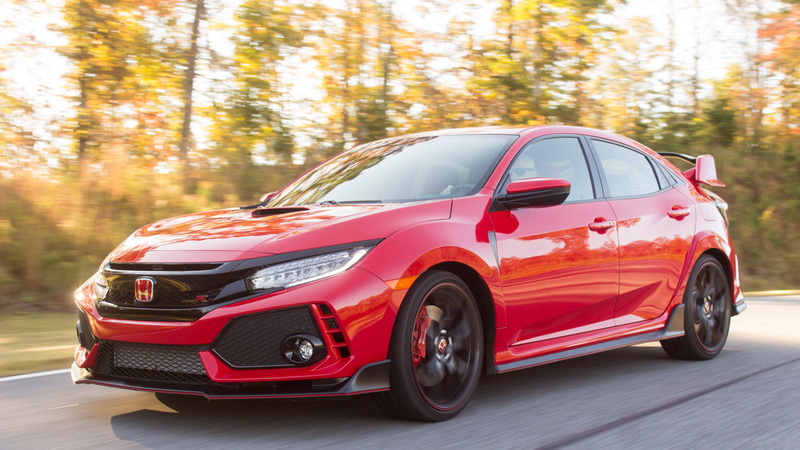 It may look silly, and it may not be as fast as some rivals, but it's damn fun to drive fast, comfortable enough to drive every day, and its mid-$30,000s price tag makes the Honda Civic Type R a bargain. Those are the factors that tipped the scales to make it the Motor Authority Best Car To Buy 2018. "It looks like a concept car for the road, because it is," said Feder, and we all agreed that the LC is stunning. A production version of the LF-LC concept car from 2012, the LC is sleek, elegant, and emotional from a brand that has often been accused of being too conservative. Cole said: "It’s certainly elegant, and considering that it’s from the same automaker that brought us the ES, it’s beyond heresy too." Padgett described it as "dashing without being irreverent, striking and a standout in its time and in its brand." Without a plan to build a grand tourer, Lexus adapted its GA-L platform for the LC. That gives it some heavy duty underpinnings, literally. The LC 500 weighs 1,000 pounds more than a Porsche 911. "Who among us doesn't carry a few hundred extra pounds?," asked Padgett. "Yes, the Lexus LC tips the scales like a Looney Tunes anvil, but damn does it carry it well." Somehow, Lexus took a full-size luxury sedan platform and made it work for a much smaller and sportier grand tourer because the LC performs on the track, too. The secret appears to be moving the mass to the center of the car and setting that weight on an advanced suspension. The 471-hp 5.0-liter V-8 sits behind the front axle, creating a near-perfect 52/48 front/rear weight balance. Double-jointed front arms provide better wheel articulation and adaptive dampers help the 20- or 21-inch wheels deal with bumps and ruts while also providing grip. The available rear-axle steering, which our car had, doesn't hurt, either. We all loved the seats and the interior styling, but we were surprised that the LC was quite capable on the racetrack. "Consider the LC’s 187-inch length an Easter egg: It positively kills corners thanks to responsive steering," said Cole. "The Lexus coupe won’t confuse many into believing it’s smaller than it is, but the LC’s sharp turn-in is a wonderful surprise." Feder noted: "It's well-balanced and progressive in its movements." Turkus liked the performance but not the feel: "Surprisingly agile for such a big, heavy car, but feedback both through the chassis and steering are too limited to really feel like a great driver’s car." To a man we were all enamored of the engine, especially its song, which provides a raucous counterpoint to the elegant looks. "Possibly the best sounding car on sale today. If I could bottle and sell the LC 500’s exhaust note, I’d make enough to buy one," exclaimed Turkus. Cole got a bit more graphic, musing that "the raucous sounds that permeate the cabin from the sonorous V-8 and howling rear tires are like two pit bulls having their way with a porcupine." Cole lauded the performance as well: "On the track, it pulls from just about any gear, from just about any corner. You don’t need to shift, but you should—if only because it snaps off clean cracks from each gear change like a bolt-action rifle." We had our complaints, too. A grand tourer should have a generous trunk, but the LC 500 offers only 5.4 cubic feet for cargo storage, not even enough for two roll-aboards. The rear seats are just there for insurance purposes, and we all think Lexus needs to go back to the drawing board for its infotainment system. The center console is also a problem and it annoyed Cole the most. "The way the center console opens—and the only way to access the second cupholder—may have been outlawed by the Geneva Convention," he complained. Our bottom line? The LC was a very close second. If it wasn't first, it was the second for most of us. Ganz called it "probably the best interpretation of the personal luxury coupe ever," Feder felt it is a half-price Aston Martin DB11, while Padgett said, "I hope it's not a one-hit wonder, because its fluid performance and jaw-dropping looks deserve a follow-up act." Porsche knows how to build a performance car. However, while the 911 and 718 twins provide engagement to go with their performance, it's dramatic how undramatic the Panamera is. A large cruiser that competes with heavyweight full-size sedans like the Mercedes-Benz S-Class and BMW 7-Series for space, comfort, and on-road opulence, the Panamera also offers track-ready performance that is simply effortless. The car Porsche provided hit the sweet spot of performance, too. It was a 440-horsepower 4S model, with a twin-turbo 2.9-liter V-6, all-wheel-drive, and rear-axle steering. Feder labeled it a sleeper. Padgett called the Panamera a "stealth bomber among showboats" and remarked, "you might read elsewhere here that it's not engaging enough; the sign of a great car is one that puts driving worries aside, especially at triple-digit speeds." Ganz ignored the boss, saying, "ultimately, it's light on fun—but that doesn't mean it's not amazingly capable on-road and on-track." Turkus felt taunted by the car. "Working out the Panamera on a track feels undramatic," he said. "It felt like the car was constantly humoring me, as if it were saying, 'Aw, look at you in Sport Plus mode. You took that turn really well. Have a gold star.' "
Turkus wasn't so impressed with the engine. "I’m sorry, but the 2.9-liter, twin-turbo V-6 is underwhelming. It sounds cool from behind the wheel—there’s so much turbo whooshing—but it also doesn’t feel much like a Porsche engine. Also, the PDK feels slow to engage off the line, even in Sport Plus mode." Like the rest of us, Cole disagreed. "Tapping the steering wheel-mounted 'Push to pass' (Porsche calls it Sport Response) is like playing the slots with speed, except I win every time," he observed. "The Panamera’s turbos belly-breathe like an athlete halfway through a sprint—relaxed, but also bolting toward the horizon." Feder summed up our track experience in the Panamera: "The performance is not only worthy of the brand, it’s mind boggling. It’s fast, quick, and composed. The powertrain, while powerful, feels sterile and lacks emotion, especially in terms of sound. The steering, brakes, and transmission are all terrific." Complaints aside from feel? Feder doesn't like the new touch controls and Cole noted the cupholders aren't sized for Big Gulps, but Padgett put into words the overall opinion: "Find a flaw on the Panamera, I dare you. It's maybe on the price tag (about $130,000), maybe on the raspy V-6 sound that suffers only because it's not a twin-turbo V-8." As Ganz added, "the Panamera is always buttoned-down and dressed up." The Stinger takes Kia in a decidedly sportier direction, and it proves for the first time that the brand can tune a suspension for performance. As we have reported, former BMW M boss Albert Biermann was in charge of tuning that suspension. Our editors found the suspension to be well sorted during the street drives. "High hopes, a lot of them achieved," noted Padgett. "The Stinger has lovely tuning for street driving, interesting looks, and a good amount of content. Its V-6 doesn't sound great." Ganz had higher praise. "Where'd this come from? One thing Kia's never gotten right—until now—is the way its cars ride and handle. The Stinger is balanced and planted on the road," he enthused. Cole was even more effusive. "It’s not a beta performance car for Kia, it’s a Gold Master release. The Stinger represents a good first start that’s ready for prime time," he gushed. "The Stinger has better balance than a middleweight fighter. It’s posed, ready, and competing for the title." However, that fighter has a glass jaw when he gets to the ring, which, in this case, is a racetrack. The tires give up grip too easily and the dampers could be a couple notches firmer to make the car more agile. The Stinger GT is equipped with 225- and 255-millimeter wide Michelin Pilot Sport 4 tires that appear to be tuned for rolling resistance instead of grip. As a result, the Stinger GT pushes forward upon turn-in, then transitions to oversteer mid-corner. That's an indication of chassis balance in our book, but the tires feel more like roller skates than suction cups. We think 245s and 285s would be more appropriate and a stickier tire compound would help as well. All of our editors commented on the lack of confidence on the track due to the tires, and that's the single greatest reason the Stinger GT fell to the bottom of this list. We had some other complaints. Rear visibility was an issue for most of us, Cole said he didn't think the interior was up to par for the class, Turkus felt the transmission was unwilling to shift on the track, and a couple editors complained about steering feel. However, others liked the interior. Turkus said the "cabin is a very nice, business-focused place." We all appreciated the power from the twin-turbo V-6, though not necessarily the sound, we all appreciated the ride quality, and we all felt the Stinger GT offers a real value. Most of all, though, we like the direction Kia is going with the Stinger. "Give it 10 percent more polish and then it's a legit threat," said Padgett. "The Stinger GT is a fantastic first effort, and truly shows how far the Korean car company has come," noted Feder. Ganz had the highest praise, saying, "it's a better BMW in most ways and it's a clear sign for enthusiasts that someone still cares about us." Just give it better tires.